It’s no surprise to me that, when faced with a new pizza recipe, we wouldn’t be all over it. It’s also no surprise that my friend Annie has dreamed up another fabulous pizza recipe being that I know one of her favorite foods, like my own, is pizza. Annie’s Spinoccoli pizza lends a silly name to a drop dead amazing pizza, combining fresh baby spinach and itty pieces of broccoli with a luscious white sauce. All baked together, the pizza reminds me of a vegetable lasagna and that’s probably why I love it so much. I’ve actually got an unforgettable spinach lasagna recipe to share with you soon but in the meantime, you must try this pizza. 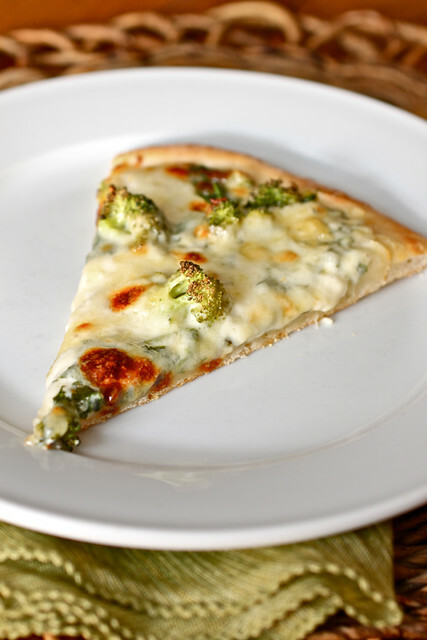 The greatest thing about this spinach broccoli pizza, aside from how it tastes of course, is that you can use up all those leftover bits of vegetables in your fridge. I know I’m not the only one who chronically has half a bag of baby spinach in my fridge with nothing to do with it except to throw it in a salad – so bust it out for this pizza! The white sauce takes all of 10 minutes to make while you’re waiting for the oven to preheat and in 30 minutes (if you go with premade dough rather than homemade), Friday pizza night is done. It’s the perfect way to end the week, don’t ya think? So just a little aside about the funky photo I took above…have you heard of Instagr.am? It’s a cool little [FREE!] app for iPhone used to snap photos, add some flair to them with different filters, and it gives you the ability to instantly upload them to Twitter, flickr, and even Facebook. 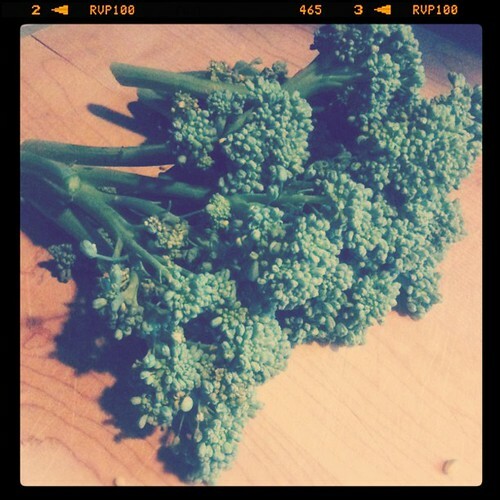 It’s a ton of fun and after I picked this broccoli from our garden one morning earlier this week, I took a quick shot. You can also link your mobile Instagr.am app to Web.stagram where you can easily connect with friends and view and comment on all of their photos (and yours too) in a running feed. It’s not so much of “another social media thing to handle” as it is a digital photo book – check it out if you have a minute. And if you’re wondering about the broccoli…I’m insanely excited that this fresh bundle is going on my Spinoccoli pizza tonight! To make the pizza, preheat the oven and a pizza stone at 500˚ F for at least 30 minutes. Roll out the pizza dough into a 12-14 inch round. Lightly brush the perimeter of the dough with olive oil. Spread a thin layer of the white sauce over the crust, leaving a border clear around the edge for the crust. Sprinkle the torn spinach leaves over the white sauce. Evenly distribute the broccoli florets over the dough. Layer evenly with the shredded mozzarella and cheddar cheeses. Finish with additional grated Parmesan, if desired. Transfer the pizza to the preheated pizza stone and bake until the cheese is melted and bubbling and the crust is lightly browned, about 10-12 minutes. Remove from the oven and let cool slightly before slicing and serving.